Hi all, I have been reading you for long time but it is my first post. I am writing you because Midi IN has stop to work. I have test it with a simple patch in live, linking IN and OUT. Could you confirm that this patch is enough to test it? If it is brocken, bould be enough to replace the octocoupler? Yeah that patch will send out a value on cc 0, on channel one. You should be able to receive it in any midi device connected to the midi din, And you also set up the correct midi port so all that is okay. If you wan to avoid havinh to push the button, to send the value. 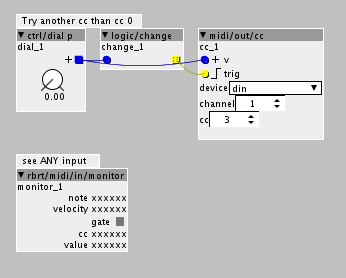 The low object will show any midi input. With your test I can see that data is received. But that's not the case when I connect a controller. I will try to get an other controller for testing it.